Ingredients: Luxury Black tea, Ginger, Cinnamon, Cardamom, Black + White pepper, Clove, Nutmeg, Rose petals. Looking for something floral and spicy? You’ve come to right place! This delicious Masala spiced chai tea with light floral notes make an excellent balance when you’re looking for something a little different. This premium assam black tea blended with the rose chai tea spices and a sprinkle of rose petals make this teas sweet and warm flavours one you’ll want to reach for constantly. 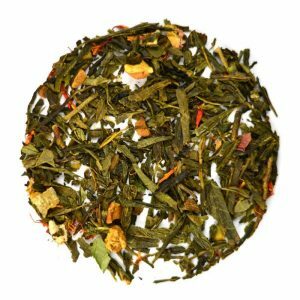 This blend is based on good strong Indian teas blended with an ancient spice recipe. The taste is heavenly – ginger and cardamom intermingle with cinnamon, cloves and hints of black pepper. The full-bodied cup is round with floral notes that tempt the taste buds and will have you crying out for more. Our favourite cup to brew it in, is one with a lid that will keep the tea hot while it steeps, such as the ASPEN or the KASSEL. Enjoy it hot, and drink this caffeinated tea during the day to stay alert. We have stayed very classical with the blend of Chai spices in this tea, to keep the flavour combination a balanced one. Adding a touch of honey to round off the infusion makes this loose leaf tea a blend to relish. Turning your Rose Chai Tea into a delicious Chai Latte is easy! Simply brew the Chai using just under half the amount of water you would normally use. Then separately heat milk and froth it using a milk frother like the EZ LATTE. Pour the frothed milk into the tea and presto! You’ve made a delicious latte! With the purchase of any product, GROSCHE provides 50+ days of safe drinking water for people in need. Moreover, GROSCHE is a Social Enterprise and certified B Corp on a mission to make the world a better place.